Diversity is a quality that the Biomechanics and Movement Science (BMSC) Program was founded on from its inception. BMSC students come from a wide range of backgrounds including athletic training, biological sciences, computer science, exercise physiology, mechanical engineering, physical therapy, and psychology. Students can pursue highly specialized research with diverse faculty and yet gain knowledge in related areas for an education that is genuinely translational. Learn more by visiting the Biomechanics and Movement Sciences Program. University of Delaware Physical Therapy (UDPT) is committed to training outstanding rehabilitation research scientists. In an effort to facilitate this commitment, a competitive funding opportunity is available in the first and/or second year Doctor in Physical Therapy (DPT) students who plan to pursue a PhD at the completion of their DPT. Many of these students will continue into the PhD Biomechanics & Movement Sciences (BIOMS) Program with support from PT faculty research grants, or a training grant from the National Institutes of Health (NIH). This NIH training grant is led by Lynn Snyder-Mackler, PT, ATC, Sc.D, SCS, FAPTA. Its goal is to improve the quality and quantity of individuals who conduct excellent research studies on the problems of people with disabilities. Graduates of this program will possess the skills necessary to contribute significantly to the knowledge base and practice in the field of physical rehabilitation. 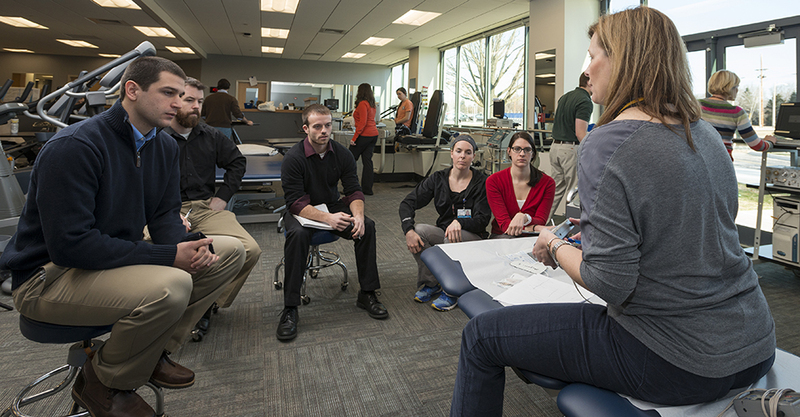 This innovative training program, coordinated through UDPT, includes outstanding faculty members from three academic units at the University of Delaware: the Departments of Physical Therapy, Mechanical Engineering, and Kinesiology & Applied Physiology. The program fuses two independent training programs: an entry level DPT, designed to train clinical physical therapists, and the PhD in Biomechanics and Movement Sciences (BIOMS). Research concentrations during the PhD portion of the program will include Applied Physiology, Applied Exercise Physiology, Biomechanics, Motor Control, and Rehabilitation Technology. The program is analogous to the MD/PhD programs that are designed to train medical scientists. Students in the proposed program will become both physical therapists and research scientists. Graduates of this training program are renowned faculty members and foster excellence in rehabilitation research.